Aphids (Homoptera Aphididae) also known as plant lice are tiny (1/8″) soft bodied, oval to pear shape insects that come in green, pink, red, brown, black or dusty gray. The woolly apple aphid has a fluffy white cottony coating that closely resembles a mealybug. They congregate in groups and feed on the plant juices of young leaves, succulent tip growth and flower buds causing curling, stunted and distorted leaves. Infested leaves can wilt in bright sunlight and turn yellow/brown. The whole plant can turn pale yellow and stop growing. For infestation, check new growth, stems and underside of the leaves. Root aphids attack plant roots and display similar symptoms. Aphids excrete honeydew which attracts ants and is the perfect medium for black, sooty mold fungus. In addition, they can also transmit incurable viral diseases. Most damage occurs when temperatures are 65-80F degrees. Aphids develop from an egg to adult and also give birth to mature insects that reproduce rapidly. Each adult aphid can produce 80 offspring within a week. Some mature adults have wings and fly, infecting other plants. A strong water spray will wash them off the plant, repeat at least 3 times. Handpicking, by squeezing the bugs between your fingers will help reduce the population. Yellow sticky traps will attract and control aphids. Homemade sprays such as garlic spray and hot pepper spray will repel the insect. Garlic spray: Mix 1/2 cup of finely chopped garlic cloves with 1 pint of water, strain and spray. Hot pepper spray: Mix 1/2 cup of finely chopped or ground hot peppers in 1 pint of water, strain and spray. Use gloves to protect your skin. If that doesn’t work use insecticidal soap every 3-5 days for two weeks. Do not use insecticidal soap on gardenia. A stronger alternative is pyrethrum/ alcohol spray: combine 1 TBS alcohol to 1 pint of pyrethrum. The solution should have direct contact with the aphids to be effective. Other chemical remedies such as Neem are available. Be sure to follow label directions for safe application on specific plants. I have aphids that come every year to my Mandevilla bush. I have found that sprays, and pinching them only is a short term fix. I have had a lot of luck when I buy a container of ladybugs and release them onto the bush. This seems to stop the aphids until next year when I need to repeat the process. Great tip! Biological control Lady bugs love to feed on aphids-isn’t nature grand! I have a mandevilla in my patio and it constantly is getting little yellow aphids (bright yellow little bugs with black spikes)â€¦within a day or two an entire branch is covered..I spray it with Neem Oil and they turn into black soot..but sure enough they reappear a few days later elsewhereâ€“short of spraying them everyday which seems impossible because I tried and its not working.. do I either get rid of the gorgeous plant that is thriving and flowering beautifully or do I give up and let the aphids go at it until winter approaches. I live in Southern California. Aphids reproduce very quickly given the right conditions. One spraying only elliminates one stage of the insect while the egg stage is there waiting. A good spray of water on the vine will also knock them off the plant and reduce populations. Be persistant, its either you or them! They may have won the battle but not the war. Donâ€™t let them win. I have a hibiscus potted tree which I keep on my sun porch. We’ve been battling teeny white flying bugs…we’ve sprayed with plant/insect spray and have taken it outside and hosed it down, but the bugs return. I have many, many plants in this area…do I need to get rid of the hibiscus. Will my other plants be affected? It sounds like white fly. Is the hibiscus outside? Do you live a in warm climate? We live in Vero Beach, FL, and have a red milkweed plant (Asclepias curassavica) on our patio (in a large glazed clay pot) that was beautiful when we brought it home in July. Despite daily watering, its branches kept wilting frequently (we thought it was stress from too much sun), so we moved it under the covered part of our patio. 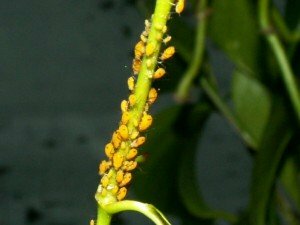 It seemed to rebound slightly, but then quickly became sickly when it developed an infestation of oleander aphids (thousands of tiny yellowish-orange aphids that look more like tiny pollen grains with tiny black legs). After an almost total leaf drop, we trimmed back the milkweed to a few scraggly, leafless, but healthy-looking branches in September. It started to sprout leaves again (still under the covered portion of our patio), and seemed to be on the mend. Today, I noticed the milkweed was again infested with the oleander aphids. Most websites claim that oleander aphids are rather harmless, causing only “asthetic” harm (personally, they give me a severe case of the heebie-geebies). But this plant is definitely suffering. What to do? It appears that pruning just stimulates the new growth that the aphids love. I can’t just trim the affected branches — we only have about a dozen stems left at present, and they are all covered with aphids. It appears that the current aphid infestation is already being attacked itself by the parasitic braconid wasp, Lysiphlebus testaceipes (Cresson); about half of the aphid colony on most leaves and branches have the appearance of papery, light brown, swollen mummies that I saw on the UF website about oleander aphids. Should I wait and see if the parasitic wasps bring this latest infestation under control or do I try to take control of this situation myself? Please help us save our poor little milkweed! How interesting. Your lucky to see mother nature at its best working with biological control. The best thing is to wait and see how well the parasitic wasps do. They should knock down the aphid population considerably or even elliminate it. I have a brand new begonia planter on my patio. Upon inspection I noticed little congregates of round green bugs which I think are aphids. What can I use naturally or artificial to remove them without killing the plants. Sounds like they may be aphids-see above article for treatment. I have a newly purchased mandevilla. I have put it on my deck in full sun and it is doing great however all the new flowers although not yet out have a yellow coating of what looks like pollen on them. Is this a pest/and what can I do about it? Could it be pollen from trees and blooming shrubs? If it is aphids see above article for treatment. I use a mixture of vegetable oil with dishwashing liquid in proportion as advised, is this mixture effective against aphids? Will it have adverse effects on the leaves sprayed with said mixture? Will the plant recover if sprayed on time? I use it mainly on my tomato plants. The mixture should help control the problem. Make sure you spray several times to get all life cycles. Here’s another aphid remedy I just found in Organic gardening magazine-June/July 2008. The alkaloid in tomato leaves are toxic to soft-bodied insects like aphids. Combine 1-2 cups of mashed/chopped tomato leaves with 2 cups of water. Let it stand overnight. Strain the leaves and remove, add another 2 cups of water to dilute the solution. Spray on the undersides of leaves or wherever you see aphids congregate. Remove tomato leaves from the lower part of your plant so it won’t interfere with tomato production. Wait till it stops blooming then trim back the dead stems and flowers. I have a scale or aphid like infestation on my Iris leaves. It is some kind of bug. I rubbed it off on leaf and looked like aphids, but doesn’t look like any aphid I have seen. Any help to get rid of this or what it is would be appreciated. Aphids do attack iris. These tiny pear shaped or rounded insects come in a number of colors, usually appear in the spring, causing curled and distorted leaves. 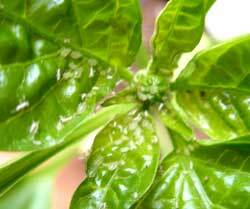 To treat for aphids spray the plant with insecticidal soap every 3-5 days for two weeks. A stronger alternative is Pyrethrum with alcohol. According to Rodale’s “Flower Garden Problem Sover”-Add 1 tablespoon alcohol to 1 pint of pyrethrum mix. The mixture should contact the aphids to be effective. Be sure they are aphids before spraying, this treatment will do little for scale.